Home › Swinhoe's storm petrel › Painted stork - Mycteria leucocephala. The painted stork (Mycteria leucocephala) belongs to the family, Ciconiidae. The painted stork is a large wading bird of stork family. These birds are widely distributed over the plains of Asia. The painted storks are usually seen in the freshwater wetlands and occasionally in the coastal regions. They are found in Pakistan, India, Sri Lanka, Myanmar, Malaysia, Thailand and Vietnam. 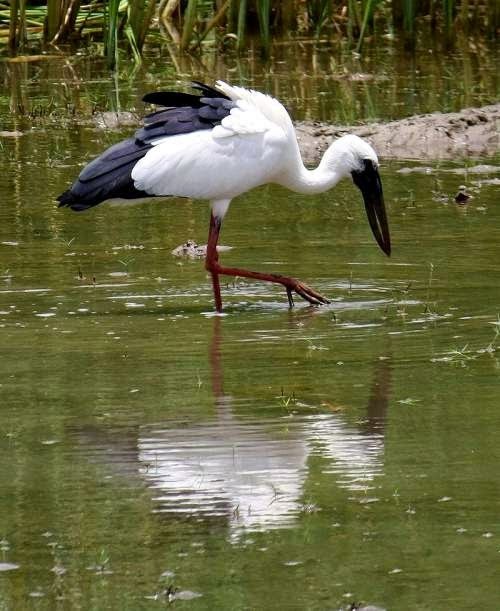 The International Union for Conservation of Nature (IUCN) had categorized and evaluated these stork species and had listed them as 'Near Threatened'. The painted stork is a large bird, measuring 90 to 100 cm in length and weighing 2,000 to 3,500 grams. They have a wingspan of about 150 to 160 cm. They have a long heavy yellow beak with a down curved tip. The bare head is reddish or orange in color. They have a distinctive black pectoral band with white scaly markings. The tertials are long and the tips are bright pink extending beyond the tail when at rest. These storks feed in groups, wading in shallow waters and avoiding deeper waters. They feed on small fish, frogs and reptiles. The breeding season extends from July to October in north India and November to March in south India. They breed in colonies on the tree tops. The platform of nests is seen in islands and undisturbed areas.The typical clutch may contain two to five eggs. The chicks are fed with regurgitate fish. Though the population in India is considered secure, the painted stork are near threatened in other countries due to poaching. 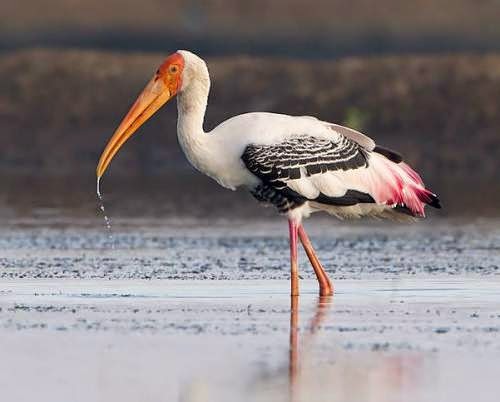 Current topic in Birds of India: Painted stork - Mycteria leucocephala. 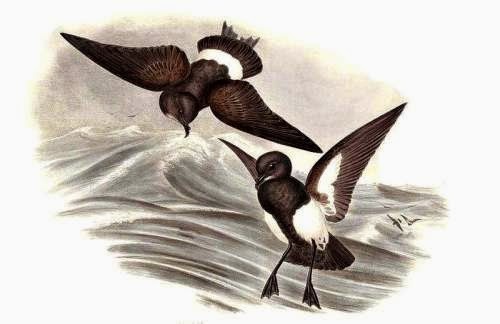 Home › Black-bellied storm petrel › Swinhoe's storm petrel - Oceanodroma monorhis. Swinhoe's storm petrel (Oceanodroma monorhis) is a small seabird belonging to the family Hydrobatidae. Swinhoe's storm petrel ranges across Indian Ocean, Arabian Sea, Pacific Ocean and Atlantic Ocean. These birds breed in islands off the coast of China, Japan, Russia and Korea. 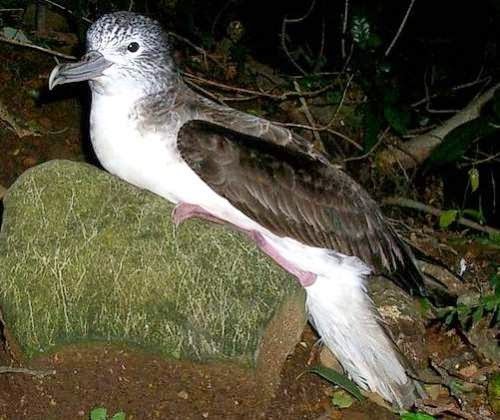 The International Union for Conservation of Nature (IUCN) had categorized and evaluated these shearwater species and had listed them as 'Near Threatened'. These petrels are small birds, measuring 18 to 20 in length and weighing 25 to 55 grams. They have a wingspan of about 50 cm. They are dark brown in color with a notched tail. They feed on small fish and shrimp. They are normally a pelagic birds and are rarely seen in the coastal waters. They breed on offshore islands. The female lays a single egg in the rock crevices and burrows. 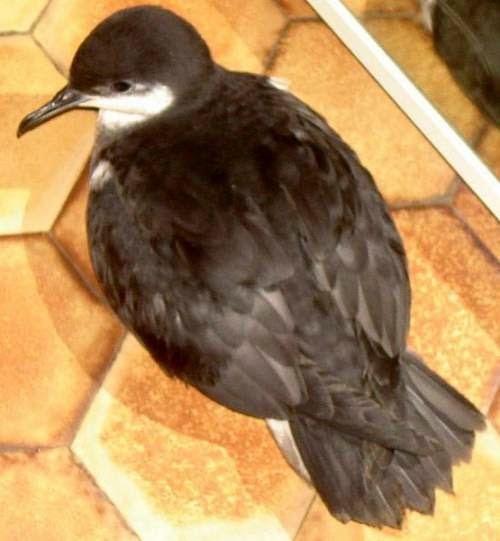 Current topic in Birds of India: Swinhoe's storm petrel - Oceanodroma monorhis. Home › Jouanin's petrel › Black-bellied storm petrel - Fregetta tropica. The black-bellied storm petrel (Fregetta tropica) is a seabird in the Hydrobatidae family. The black-bellied storm petrel ranges across tropical and subtropical major oceans including Indian Ocean and Arabian Sea. It is found in Antarctica, Argentina, Australia, Brazil, Chile, New Zealand, Oman, South Africa, South India and several oceanic islands. The International Union for Conservation of Nature (IUCN) had categorized and evaluated these petrel species and had listed them as of 'Least Concern'. These petrels are small, measuring 20 cm in length and weighing 40 to 60 grams. They have a wingspan of 45 cm. They are near blackish in color and have white upper tail-coverts. They are rarely seen from the shore, except during breeding season starting by September. They feed on small fish, squid and shrimps. 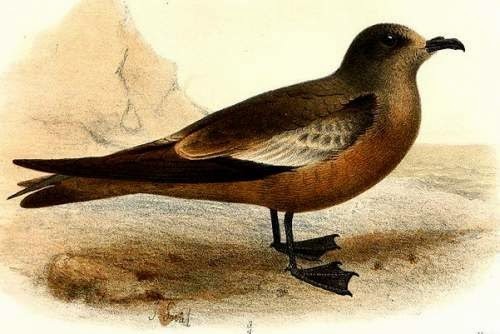 Current topic in Birds of India: Black-bellied storm petrel - Fregetta tropica. Home › Tropical shearwater › Jouanin's petrel - Bulweria fallax. Jouanin's petrel (Bulweria fallax) is a seabird belonging to the Procellariidae family. Jouanin's petrel is found in the Indian Ocean, Arabian Sea and Red Sea. These bird species are seen off coasts of Djibouti, Indonesia, Pakistan, India, Kenya, Maldives, Mozambique, Oman, Saudi Arabia, Seychelles, Somalia, and Yemen. The International Union for Conservation of Nature (IUCN) had categorized and evaluated these bird species and had listed them as 'Near Threatened'. These birds are small in size, measuring 30 cm in length and weighing 150 to 180 grams. Their wingspan is 75 to 85 cm. They are dark sooty birds with wedge shaped tail. They feed on fish, squids and shrimps. They are marine and pelagic and are observed far from the shore. Their natural habitats are open seas and shallow seas. They have been recorded to breed on Socotra. Current topic in Birds of India: Jouanin's petrel - Bulweria fallax. 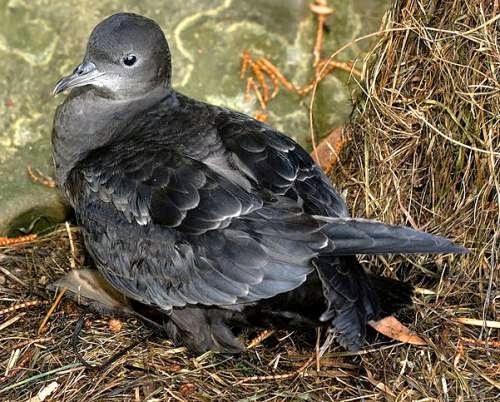 Home › Cory's shearwater › Tropical shearwater - Puffinus bailloni. The tropical shearwater (Puffinus bailloni) is a seabird in the Procellariidae family. The tropical shearwater ranges across Indian Ocean and Pacific Ocean. There are four recognized subspecies of these bird species. The subspecies are: P. b. nicolae, P. b. bailloni, P. b. dichrous and P. b. gunax. These birds are small in size, measuring 25 to 35 cm in length and weighing 150 to 250 grams. Their wingspan is 65 to 75 cm. These birds are dark brown in color with white throat. They are pelagic, but quite often sighted offshore. They are seen off south India, Japan and east Africa. They feed on fish, squid and shrimp. These birds breed during summer months. Current topic in Birds of India: Tropical shearwater - Puffinus bailloni. Home › Streaked shearwater › Cory's shearwater - Calonectris borealis. The Cory's shearwater (Calonectris borealis) is a seabird in the family Procellariidae. The Cory's shearwater ranges widely in Atlantic Ocean, Mediterranean and occasionally in Indian Ocean. These species breed in islands off Portugal and Spain. These shearwater are medium sized birds, measuring 50 to 55 cm in length and weighing 600 to 1000 grams. Their wingspan is 110 to 125 cm. It has brownish-grey upper parts, white underparts and a yellowish bill. They appear very similar to C. diomedea but much larger. They are pelagic, except for breeding colonies, they are not seen from shore. They feed on fish, molluscs, squids and shrimp. They are noted for following fishing vessels. They breed from April onwards. They nest among rocks and burrows. They lay single egg and both the parents take part in rearing the chick. Current topic in Birds of India: Cory's shearwater - Calonectris borealis. 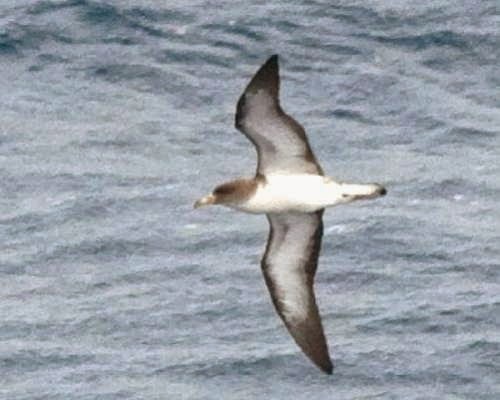 Home › Short-tailed shearwater › Streaked shearwater - Calonectris leucomelas. The Streaked Shearwater (Calonectris leucomelas) is a seabird belonging to Procellariidae family. The Streaked Shearwater ranges across Pacific Ocean and Indian Ocean. These birds nest on islands off Japan, China, Korea and Russia. After breeding they migrate to Indian Ocean and are seen off the coast of Australia and southern India. These birds measure 45 to 50 cm in length and weigh 450 to 550 grams. They have a wingspan of 100 to 110 cm. The shearwater is brownish in color with mottled head and mottled white underparts. The bill is rather large and pale. The legs are pale pink in color. They feed mainly on squid and fish. They are known to follow fishing vessels. They breed from March onwards. They nest in burrows in high forested hills. Current topic in Birds of India: Streaked shearwater - Calonectris leucomelas. Home › Flesh-footed Shearwater › Short-tailed shearwater - Ardenna tenuirostris. 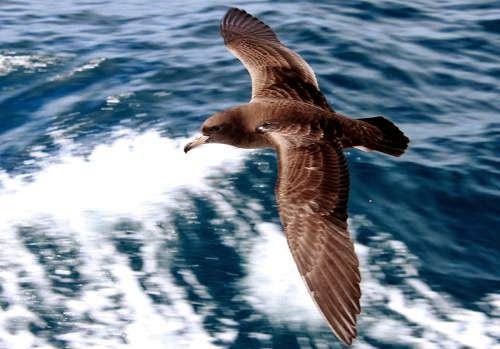 The short-tailed shearwater (Ardenna tenuirostris) is a seabird belonging to family Procellariidae. The short-tailed shearwater ranges across Pacific and Indian Oceans. These shearwaters are migratory birds breeding in Tasmania and Australia. These birds are medium sized, measuring 40 to 45 cm in length and weighing 500 to 900 grams. They have a wingspan of about 100 cm. These birds are blackish brown on the cap and slightly paler over rest of the upper parts. They have blunt-tail and black-bill. They are seen inshore and offshore. It feeds on fish, squids and shrimps. They breed during September and October. Both the parents take turn to feed the single chick. Current topic in Birds of India: Short tailed - Ardenna tenuirostris. Home › Barau's petrel › Wedge-tailed shearwater - Ardenna pacifica. 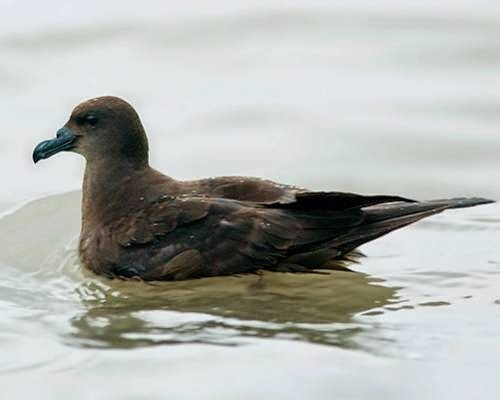 The wedge-tailed shearwater (Ardenna pacifica) belongs to the seabird family Procellariidae. The wedge-tailed shearwater ranges across the tropical Pacific and Indian Oceans, breeding in the islands off Japan, Hawaiian Islands, Seychelles, India and Australia. 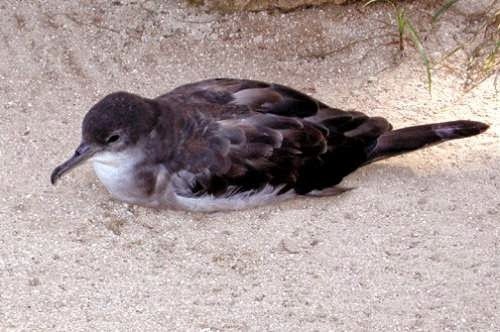 There are two recognized subspecies of these shearwaters. The subspecies A. p. pacifica ranges across Pacific Ocean. The subspecies A. p. chlororhyncha ranges across Indian and Pacific Oceans. These shearwater are medium sized birds, measuring 35 to 45 cm in length and weigh 300 to 600 grams. These shearwater have a wingspan of about 100 cm. They have characteristic wedge tail. They feed on fish, shrimp and squids. They pick feed from the surface of water as well as by diving. These shearwater establish breeding colonies and nest in burrows. They are monogamous and make long term pairing bonds. Both male and female incubate the single egg. Both the parents take turn to feed the chick. Current topic in Birds of India: Wedge-tailed shearwater - Ardenna pacifica.